With a purpose to lead families into a life where exceptional wellness is the norm, we do all that we can to help build a stronger Montclair community. Through talks hosted at True North Chiropractic and corporate wellness talks, Dr. Scott strives to educate the community one family at a time. For more information, please see our Calendar of Events page. 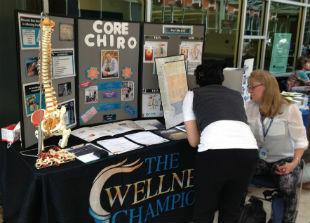 We do in-house workshops at True North Chiropractic to discuss where health comes from. Our goal with these is to help you understand what your body needs to function properly, support your care and achieve your goals and values. Instead of talking about diseases, we’ll talk about what you need to get well. It becomes pretty simple … eat clean, move often. You can put yourself in a great position to be well. And, with chiropractic creating a healthy nervous system, you can deal with the stresses of life and focus on living your best life. We’ll provide you with your scans and teach you what they mean, so that you can track your progress. We’ll address your lifestyle habits and how they affect your health so you can make any changes necessary to live your best life. Whether you desire tips on eating clean or exercising, we’ll help guide you to wellness. A key element of Dr. Scott’s practice is the promotion of wellness through community and corporate wellness screenings, presentations and expos. He has been an instructor and speaker at national seminars, as well as local businesses, corporations, public service organizations, athletic teams and clubs. For information on how to book Dr. Scott for a presentation, please contact our office today!